Alaska's climate puts grasses to the ultimate test. There are 10 U.S. Department of Agriculture climate zones within the state of Alaska, ranging from cold to bone-chilling to positively Arctic. Homeowners and landscapers in any of these zones need to use cold-tolerant grasses, which are generally sold as blends of several types of seeds to provide more resistance to disease, fungus and insects. Most turf grass mixes used for Alaska’s lawns, sports fields, and golf course fairways and greens rely on commercial mixes containing native and other grasses. Nugget bluegrass (Poa pratensis L.) found growing wild on the beach at Nome, according to Landscape Alaska, evolved into a lawn grass with a bit of help from University of Alaska Fairbanks botanists. This grass “just will not die during the winter,” Landscape Alaska states. UAF also developed boreal red fescue (Festuca rubra L.), also known as Arctared, based on wild grasses in Interior Alaska. This fescue spreads through underground stems. The red in its name refers to the seed head it displays in late summer. Of non-native species, Kentucky bluegrass (Poa pratensis) is suitable for Alaska lawns in milder coastal areas, especially when mixed as 65 percent of a blend with 35 percent red fescue and 5 percent ryegrass. 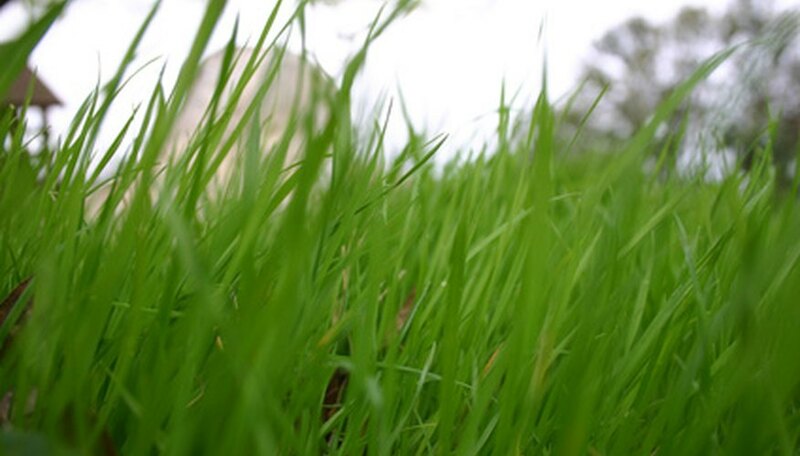 For a shadier area, a lawn mix can contain 50 percent Kentucky bluegrass, 45 percent red fescue and 5 percent ryegrass. For erodable areas, increase the ryegrass to about 10 percent, recommends OutsidePride.com. Bluegrass prefers a medium mowing height and tolerates Alaska’s sometimes-acidic soils. This fine-textured grass (F. rubra subsp. rubra) grows in part shade and is useful in a mixture with bluegrass. Fescue is very tolerant of soil acidity. Most commercial mixes contain 'Boreal' and 'PennLawn' varieties of fescue, according to the University of Alaska Fairbanks Agricultural and Forestry Experiment Station. Champion Blue variety ryegrass (Poa pratensis) works well for lawns that may have problems with erosion. This grass establishes quickly and shows good drought tolerance and poor-to-moderate shade tolerance. It too is tolerant of acidic soils.